Our mandate is to focus on human scale multi-residential developments (think The Commons Brunswick) as well as focus on greenfield development, which is undeveloped land in a city or rural area being used for urban development (think The Cape). In a nutshell, we’re working towards building and retro-fitting healthy and happy cities. A PLACE WHERE LIFESTYLE, SUSTAINABILITY AND DESIGN MEET. Come 2014 we were ready for our next development, Oxford and Peel in Collingwood, designed by the team at Jackson Clements Burrows Architecture. 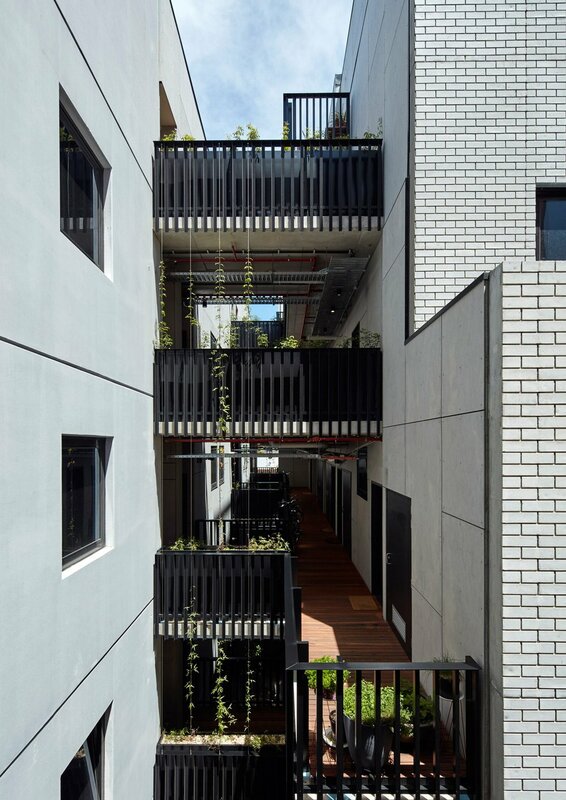 This building has 53 apartments, a communal rooftop space overlooking the city and two commercial spaces on the ground floor. Oxford and Peel was completed in 2016 and continues our philosophy of sustainable and community focused development. this is how homes can tread lightly on this planet. In 2017 we decided to go hard or go home at our greenfield development The Cape (in Cape Paterson on the south-eastern coast of Victoria). Our creative director Berry teamed up with Clare Cousins Architecture to design and build the first 10 star home in Victoria. Boom. And the best bit? The 10 star home is affordable and accessible! It was even featured on Better Homes and Gardens and also won the HIA Greensmart home of the year award. The Cape is our eco village development at Cape Paterson in Victoria. We got super lucky with this site, as it’s one of the last greenfield development right on the coast in Victoria. While the site is large enough for 500 homes, we made the decision with our partners to build a maximum of 220 environmentally friendly homes, allowing more space for veggie gardens, parkland and a shared community hub and event space. Not to mention the path all the way through to the beach. Yep, when we say right on the coast we mean, there's just a bit of bush between your home and the ocean.